The HSE says it is working to make the phone line accessible “as soon as possible”. DISABILITY CAMPAIGNERS HAVE raised concerns about the HSE’s My Options crisis pregnancy hotline not being accessible to people who are deaf or hard-of-hearing. Following last year’s vote in favour of liberalising Ireland’s abortion laws, terminations became available at hospitals, family planning services and GPs on New Year’s Day. 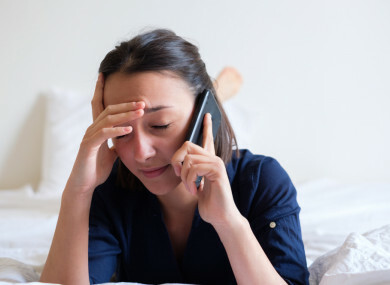 A new My Options freephone helpline (1800 828 010) was also launched to provide people with information about continued pregnancy support and abortion options. In a statement the HSE said it is working to make the hotline accessible for deaf people through additional channels “as soon as possible”. It added that is it “hoping to have a freetext number and email address available next week in advance of establishing a webchat service”. A lot of work has been done and is ongoing to set up services to care for women, and the HSE will provide information to women and to healthcare professionals about where and how services are available as they come on stream. Face-to-face unplanned pregnancy counselling can also be arranged in clinics around Ireland. The contact details for the clinics can be found on this webpage. Campaigners say the lag in establishing the services is another example of people with disabilities being an afterthought in Irish society. “This happens with almost everything,” Evie Nevin, the founder of Disabled People for Choice, said to TheJournal.ie. ‘Hopefully’ doesn’t fill us with confidence. This should have been sorted from the beginning. A week or two could mean the difference between being able to access abortion or not. What if someone is nine-10-11 weeks (pregnant) now? Nevin added that in October several disability groups submitted a 27-page document to the Department of Health detailing problems the abortion legislation will create for disabled people. The submission has yet to be addressed, she said. “In all the debates, there was no mention of our concerns. I feel this is another prime example of people with disabilities being an afterthought in society,” she said. McGrotty, who is also an Irish Sign Language (ISL) presenter on RTÉ, said that, while having text-based methods of contacting the helpline is significant in improving access, it is also important to be aware that for people who use Irish Sign Language as their native language, English is their second language. The Irish Sign Language Act, which was signed into law in 2017, guarantees the right of Irish Sign Language users to use ISL as their native language and outlines the duty on all public bodies, including the HSE, to provide ISL users with free interpretation. “I hope that the HSE have plans in place to translate all of the information on MyOptions.ie into ISL and to highlight the Irish Remote Interpreting Service (IRIS) as another alternative means of getting in touch with the helpline,” she concluded. Email “'What if someone is 11 weeks now? ': Concerns that HSE's abortion helpline fails to provide for deaf people”. Feedback on “'What if someone is 11 weeks now? ': Concerns that HSE's abortion helpline fails to provide for deaf people”.